Above you will see the cover art of my new story collection, HIDEOUS FACES, BEAUTIFUL SKULLS, from Wildside Press. In this collection of thirty stories of horror and the bizarre, you shall enter a boundless realm of dark magic, evil glamour, and strange love. As with any collection of my work, you will encounter monsters aplenty: magic zombies, evil cats, alien lovers, aquatic humanoids, a vicious Egyptian monstrosity, Internet witches, ghouls and others that defy description. Michael walked up to the door and looked inside. The blue light came from a tinted bulb in a shadeless lamp. Thin copper wires were strung across the room at various levels; every piece of furniture seemed to be caught up in the tangle. The breeze from a fan on high-power made the wires hum. On a brass bed in the center of the room reclined a pale man, bundled in quilts and pillows. His long black hair was thick and coarse, like a horse’s mane. He wore a tattered bathrobe over a gray sweatsuit. Michael decided the pale man was probably twenty-five, just a few years younger than himself. An excerpt from “The Voice of the Pangyricon”…. Something horrible stepped off the platform. It was a corpse. A walking corpse with blue skin, streaked with dust and what looked like thick strands of yellowish-green cobwebs. Its eyes were tightly squinted shut. Its face was smeared with blood and strings of fresh meat hung from its broken teeth. “Attention, Daniel!” I screamed to the Pangyricon’s computer system. “Daniel, help us! Activate security alert!” None of us had any weapons. There had never been any need for them. “Yes! Look what it did to the calf!” Quinn cried. The creature’s eyes slowly opened, revealing twin milky-white orbs. Apparently it had needed some time to get used to the light. It rushed to the door, which slid open, like all work area doors when somebody stepped up to them. The thing then raced down the hall…. Mrs. Vultaine had invited six to dinner; invited them with crisp black cards, the message embossed in gold leaf. Each guest had been instructed to bring one companion. Thirteen at table did not fret the hostess: this was a woman who had survived strange diseases, stranger travels, and far too many years of perilous existence. Thirteen? Pshaw. Just another number. The widow walked tall through the dining room, observing, correcting, at times praising her servants during preparations for the evening. She wore black silk pants and a matching blouse with the shoulders cut out. She knew this was a very young fashion, but no matter. She had a beautiful face, regally angular and as pale as milk; long, silver hair; even, white teeth; and soft, fine-boned hands, anointed with expensive creams. And she still had smooth, lovely shoulders: this the world had a right to know, and she refused to hide them. A sad-eyed maid with delicate features poured nuts into a crystal dish. The maid flashed a nervous smile and hurried off. The widow turned her attention to the table settings. Five forks, five spoons, three knives per plate – and such plates. Plates of glass, gold, silver and polished bone: no two were alike. Green lizard-fat candles. Napkins with a pattern – goats, moths and daggers –matching that of the tapestries on the walls. She entered the great hall to make sure the display was in order. The curious objet, or perhaps objets, d’art would amuse and surely disconcert her guests. This pile of gleaming metal appeared to be composed of parts from a disassembled golden harpy. A wing and a ribcage topped the pile; around the edges, one could detect a spine, a hip, and some extravagant clockwork organs. 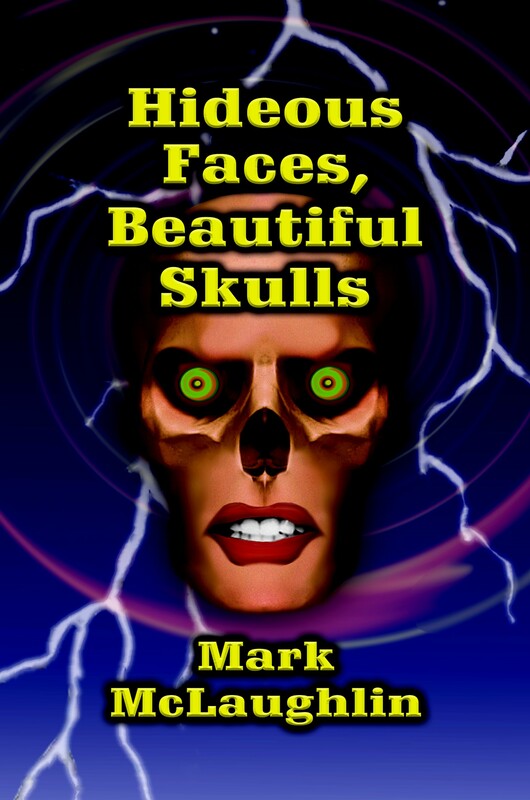 This entry was posted in Uncategorized and tagged hideous faces beautiful skulls, horror fiction, horror stories, Mark McLaughlin, wildside press. Bookmark the permalink.